We’ve reached the end of this series, my friend, and so I decided to finish it off with a dish that bridges right into fall meals quite well. It also takes advantage of some later garden produce and, being vegetarian, it hits the “healthy” factor pretty hard. Best of all, Sarah claims this to be the best meal she’s ever been involved in preparing in the kitchen. I wouldn’t go quite that far, but I certainly liked this one, as did the kids. This was far and away the biggest vegetarian meal hit we’ve ever done for our family of four. Our cost was $1.89 for the squash (it’s $0.99 a pound right now), $0.75 for the ginger root, and $1.42 for the coconut milk. 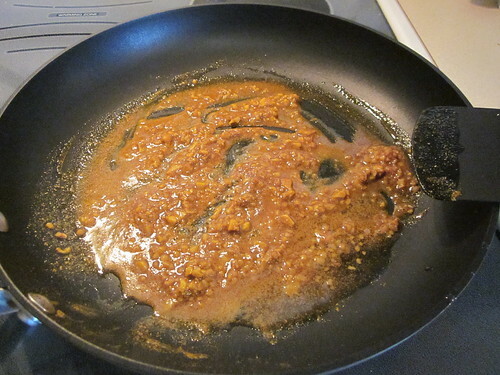 We also used somewhere around $0.05 worth of oil, $0.10 of curry powder, and maybe $0.10 of garlic, all of which we had on hand. That adds up to $4.31 for the ingredients for this main course, and we had enough for two adults and two children, with enough leftovers for another adult. 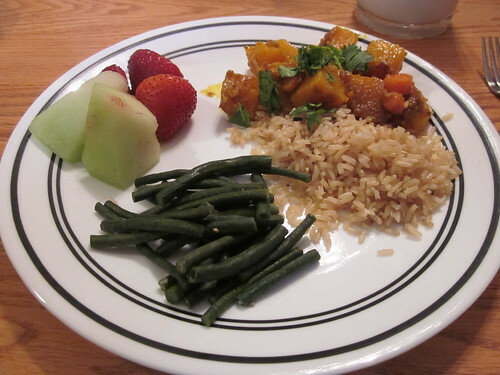 With it, we also served brown rice (perhaps $0.35 worth, by my own estimation), green beans from our garden, and some leftover fruit salad. Each plate cost about $1 overall, in my estimation. 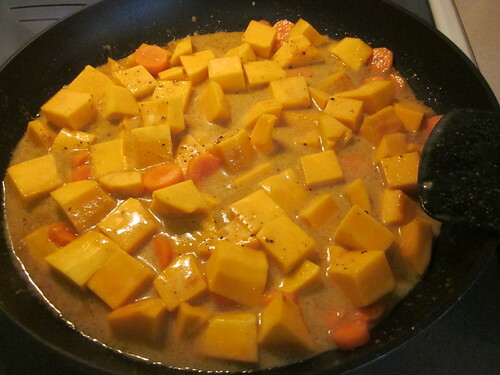 This recipe is based on the “Butternut Squash, Brazed and Glazed” recipe found on page 364-365 of Mark Bittman’s How to Cook Everything Vegetarian, which really has been an excellent introduction to vegetarian meals for an omnivore like myself. 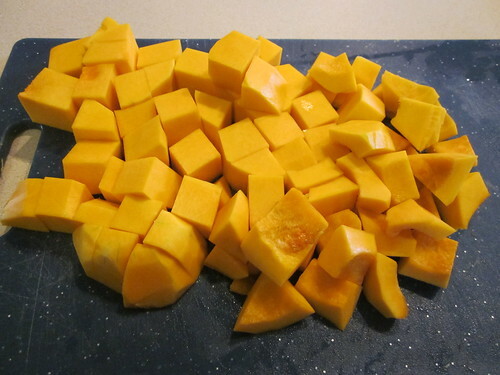 Peel and cube the squash (doesn’t it look deliciously orange? 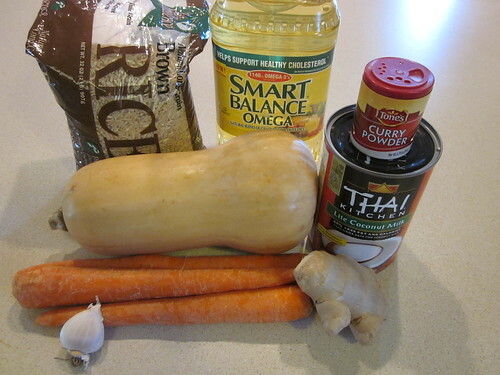 ), peel and cube the carrots, and peel and mince the ginger. 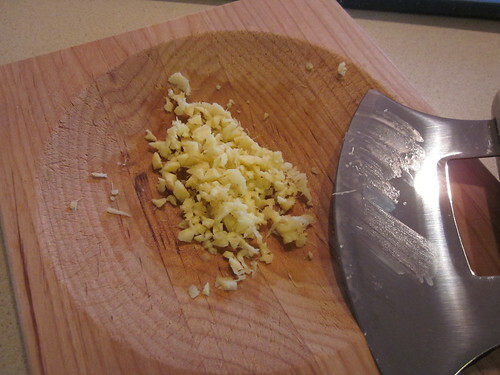 We also minced the garlic right in with the ginger, so that’s why it looks like quite a bit more than a tablespoon there. Often, prepping the vegetables is my favorite part of making a meal. The smell of fresh vegetables and herbs and spices, like fresh garlic or fresh onion, just makes your whole house smell great. Wait for it to color a little bit – about four minutes or so, by our estimation. This part smelled great. The smell was so wonderful and strong that it brought our children downstairs to find out what was going on. We left it there for fifteen minutes, stirring it around every five minutes. That’s all it took! 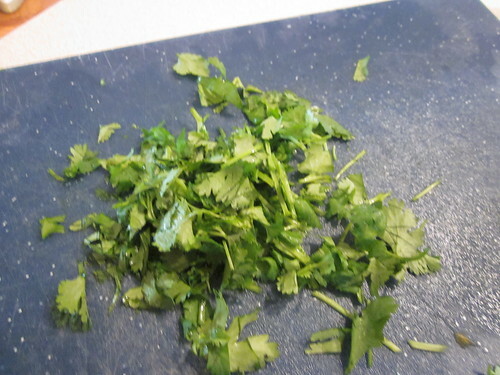 For garnish, we chopped up the last of our cilantro (which has popped up in other recipes during this series). You don’t necessarily need a garnish – it just makes it look a little prettier as it adds a strong green color. On the side, we prepared some brown rice and used some of the green beans from our garden, steamed. You’ll see above that most of the green beans pictured are long and thin. This year, we tried “asparagus” green beans in our garden and this is how they grew. They were okay, but not spectacular. 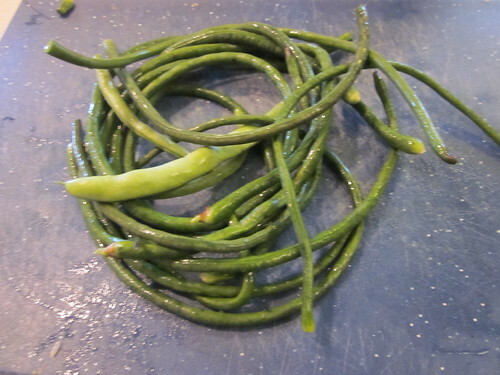 I would probably choose the thicker green beans in the future (one of which is shown here, for comparison’s sake). It was a delicious all-around hit and a great summer-into-fall way to close out this series. What comes next? Now that this series is over, what comes next in this time slot? In a week or two (possibly next Friday or possibly the Friday after that), I’m going to start a photo-heavy series on something that’s quite a bit different than anything I’ve done as of yet on The Simple Dollar. It should run for about ten weeks. After that, I’m going to return to doing some Friday food posts on a semi-regular basis.